The lack of space in our hobby is generally discussed from a layout size perspective. Everyone dream of a basement empire and, supposedly, the success of model railroading is measured in similar way we assess the Roman empire successes in term of territorial addition. However, issues with available space can be much more complex than find a fitting room for a layout. It has been proven more than once layouts of any shape and size can share the same amount of interest. Unfortunately, stuff like tools, working space and storage can hardly be compressed. Many people will work with very minimal space and it is certainly doable. But as you collection of rolling stock, locomotives, parts, scratchbuilding supplies and tool grow, the kitchen table and office desk aren’t no longer viable solutions. Over the last decade, I’ve been pursuing my hobby at my office desk. It’s a cluttered surface about 10 sq. ft. with an effective working area barely the size of a small cutting mat. Parts and supplies are stored as best as I can in cardboard boxes in various cupboards around the house. While I know were my stuff is generally stored, it happens I make serendipitous discoveries of parts I forgot I ever bought. Another problem is raised by working on multiple projects at a time. I’ve learned that when working on my Harlem Station layout fleet. Models in various stage of completion were all over the place. The final nail in the coffin is the spray booth which Louis-Marie built a few months ago. It sits in the middle on the room, on cardboard boxes near a window. Far to be efficient and certainly bulky! While a part of the problem is due to my lack of organization, I must recognize conditions aren’t there to improve the situation. It why, as my home renovations progress, I’ve been thinking about creating a decent workshop in my basement. Hobby room first rough sketch. This is a basic concept that will have to be refined over the months, but it gives a general idea of what I’d like to achieve. 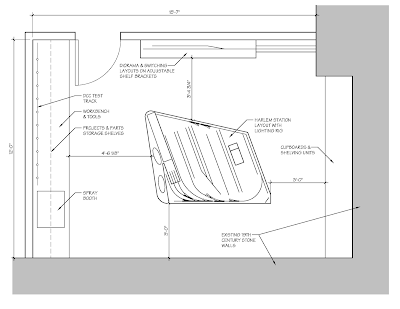 First, it would be a dual purpose room serving as a workshop and a layout room. Minimal parameters are that aisle around my Harlem Station layout should be minimally 3 feet large. Going under that dimension would be foolish. Second, storage space should be plentiful and varied to accommodate the collection, supplies and tools. I imagine a long workbench with storage units for tools and supplies. One section could be dedicated to painting with the spray booth conveniently located near the exterior wall. It would also provide some space for vats used to strip paint from model. A long DCC test track would be available to program and test locomotives. Under the working surface, several drawers would be handy for parts, tools and supplies. Over the workbench, I imagine various shelves to store ongoing projects. On another wall, I would install shelf brackets units to display and operate various small dioramas ad switching layouts I built in the past. Nothing bulky, just something both convenient and adjustable. I could also easily imagine displaying some models over the layouts. Finally, another wall would provide extensive storage capacities. It could be cupboards and shelves. These would be useful to store the collection in a pragmatic and efficient way. Havign several interests, I’d be pleased to dedicate various spaces to specific themes determined by our layouts (Hedley Junction, Harlem Station, St-Pie, etc.). Rolling stock could be classified according to state of completion, keeping completed models together and ongoing and future projects somewhere else. Some will wonder why I didn’t include a possible benchwork around the room for a future layout. It could be possible, but I prefer to keep that dangerous idea at bay for the moment. I’ve got enough on my plate and still have to put Harlem Station in operation. The room itself is large and versatile enough to be adapted for a future project if my interests changes over the year. I planned the room with the future in mind, but certainly don’t want to open the door to a sprawling monster. This choice is also motivated by what I’d like to call neatness. A neat room has more appeal to me than a half finish spaced cluttered with a badly presented layout. I firmly believe the way we interact with our layouts is also a matter of presentation. For the moment, I can easily imagine Harlem Station standing in the middle of the room, at a realistic height and with excellent lighting fixtures bringing attention and life to it. I see it just like a billiard room, with the layout shining in the middle and around which we can gather and interact with the hobby. At some point, I would easily imagine installing a small wooden shelf around the layout fascia to put a glass of your favorite beverage, some switching paper work or simply rest your arms. Something comfy and finished… a real piece of furniture. Additional notes: Keen observers will quickly find out an islant layout takes up a LOT of space in a room, particularly when you want decent aisles. An around the wall layout would certainly be much more efficient, however, at this point, it's a question of choice. 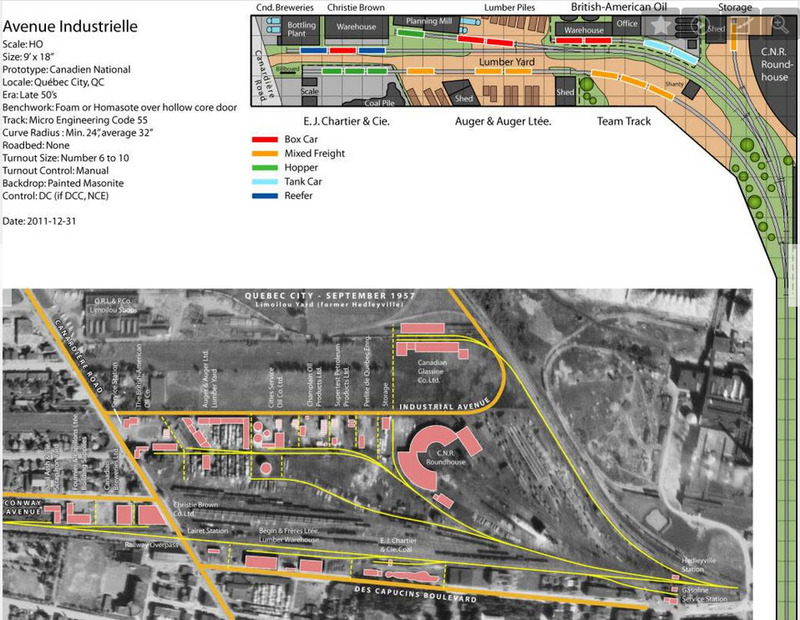 It must be noted Harlem Station is a fully prototypical layout that has about 45 specific car spots and can handle up to 55 cars at once. It is packed with action and don't suffer any kind of selective compression. Operating the layout is just like operating the real thing without compromise. At this point, it can be a selling point. Also, it must be noted I'm not eager to install anything on the long stone wall because of heating, plumbing and various mechanical reasons. August generally means very little actual modelism due to summer vacations and surprisingly a lot of free time to think too much about layout design. This is habitually an intense period of layout design for me and a good excuse to explore various ideas for a projected home layout. I’ll be blunt, I’ve been in that house almost a decade and have yet to build and operate a layout that will stand the test of time! But honestly, layout design in itself is a hobby worth pursuing and I see no harm honing my skills chasing an elusive project! It also becomes clearer each day my house can only accept small layouts of the shelf type, which isn’t a problem in itself and can lend itself to explore various themes and era without having to be chained to an ever growing monster in the basement. In fact, it is highly possible a future layout will be a combination of stacked small vignettes depicting very various prototypes on a few shelves. I like testing ideas and going smaller is the way to go for me to keep my mind focus. So what’s on my mind right now? Well, a lot of ideas including a portion of a paper mill which I’m refining from an initial concept from last year (probably set in the 60s or 70s) which would be kind of cool given I’ve got all the rolling stock, tracks and structure parts required. It could be CN or CP depending on the mood. But I’ve also wanted to explore something even smaller and more mundane that could put to use my 1950s CNR fleet by revisiting a very old concept. Back in 2012, I created a switching layout track plan based on Avenue Industrielle district (Industrial Avenue) in Québec City. 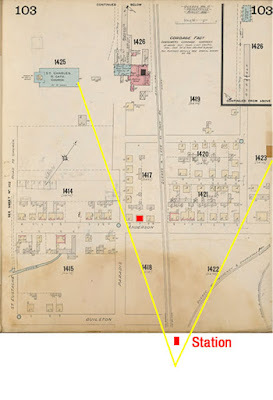 This industrial area – as its name implies – was located within CNR Limoilou Yard and was basically a very long single track spur with some sidings serving various small and medium-sized customers including a builder supply, a produce warehouse, a lumber yard and about four oil dealers. It had appeal due to its gritty railroading look and grimy appearance. As a switching layout, it linear quality made this particular prototype an excellent candidate because it could fit on a very narrow shelf. As a challenge, I tried to build it and reached a decent stage of completion (by my own sloppy standards) that confirmed some ideas had merit. Ultimately, the project failed when I decided to renovate my office room and wall space was no longer available. But to be honest, many other small things must be factored in to understand why this endeavour didn’t come to fruition and how it could have been different. Not half bad, but decidedly cluttered. Back then, I still had the typical model railroader mentality firmly ingrained though I tried to fight it back as much as I could. Thus, while following Lance Mindheim’s design guidelines, it was still an exercise in cramming 1 square miles of dense industrial setting into two hollow core doors. As if things weren’t good enough, I tried to add here and there elements for the sake of operation interest and diversity… We all know this couldn’t be good! The “I Want It All” syndrome was left unleashed and in a matter of time the project became really messy. Worst, I didn’t take the time to analyze correctly the fire insurance maps, missing subtle elements that would have made my life far much easier and the layout surprisingly more interesting. Fast forward almost 7 years later and we can try and see how I would approach such a layout. First, instead of using selective compression and trying to fit as much elements as possible to represent the entire spur and neighborhood, I would only select a section and model it as close as possible to the prototype. It means the layout wouldn’t depict the entire switching job, but only one part. I also would adopt the “less is more” turnout approach I’ve been exploring since the last few years, keeping in my 20 minutes to 1 hour long sessions are a realistic goal. Finally, the layout would be almost at eye level, thus quite shallow. Due to space limitation, but also to make handling easy when building the layout at on the work bench, I would select a compact footprint. A good example would be IKEA LACK shelf, which is about 75” x 10”, which is sufficient for a small switching layout. These shelves lend themselves well for small layout in similar fashion to hollow core and their concealed supports are strong enough for this use since they can hold up from 18 to 44 lbs depending on wall type and fastener, which is more than enough for a very simple project. (Be aware IKEA uses a flimsy concealed shelf bracket for its shorter LACK shelves. Though far less sturdy, I’ve used some of them to display locomotives and they have hold well. In case of doubt, add shelf brackets.) A small 36” long cassette can be added to make switching easier, but it should be stressed it is possible to have a fully functional and realistic HO layout without using it. Ken Olsen’s Dawson Station N scale layout is such an example and it could be recreated in HO scale without problem. As long as you take in account the number of cars and how to handle them in the final track design, it shouldn’t be a major limitation. Now, let’s see which part of Avenue Industrielle is worth our attention. While it is easy to select the end of the spur, one could elect to model any part of it. The level of traffic, complexity and modelling potential are about the same. I consider two locations are interesting and both would be equally pleasing to build. Let’s take a look at both. The first option is obvious: model the end of the spur. 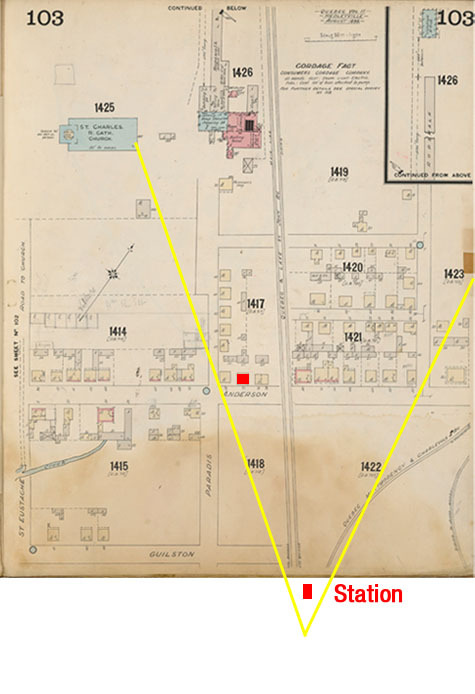 This area has a rather large British-American oil warehouse that received boxcars and tank cars and a large lumber yard. Logs and finished lumbers would be the main traffic. All in all, an interesting proposition well framed between the oil dealer that makes a great visual point of interest and the lumber piles behind which the incoming train emerge. About 6 car spots are possible, which isn’t bad at all, including specific spots at the oil warehouse. However, it seems a little bit hard to operate efficiently using a short cassette as it could easily induce additional back and forth movements, making it a good plan to build up frustration… Let’s see if we can’t find a better track plan. First idea: modelling the spur end. The second option is modelling the area just right of the lumber mill. At first it may look counterintuitive to model the middle of a siding! But beware of the “boring” aspect of this location. Upon closer inspection, one starts to find merit in what seems a rather mundane place in the middle of nowhere. 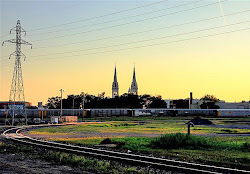 This area is characterized by a few long sidings serving several industries including a builder supplies (Perlite de Québec), three small oil dealers and a produce warehouse. In a matter of time, we now know we will have attractive tank cars, boxcars, colorful reefers and probably more… not bad. 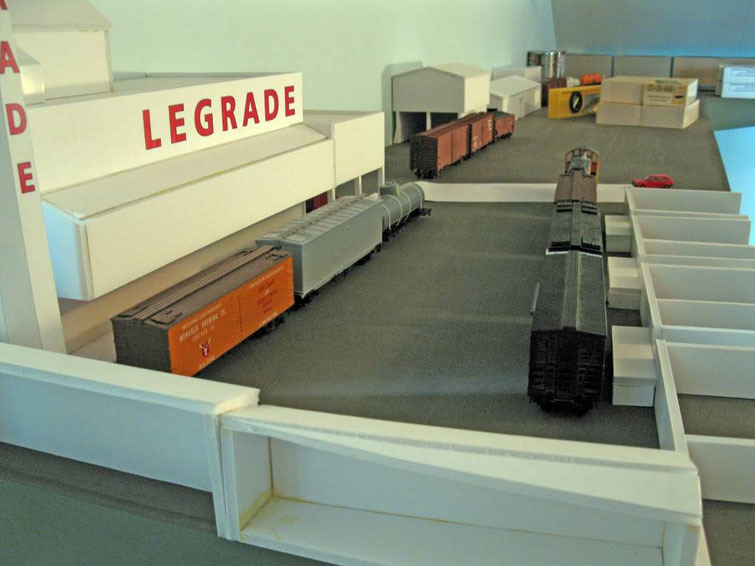 As for framing the scene, the lumber piles will help conceal the layout left end while the right end should be cluttered with lumbers, trash, piles of material and vehicles as was the case in real life. From pictures I’ve seen, the area was littered with trash, muddy and heavily polluted. Forget neatly ballasted track, it was an industrial waste wonderland. However, an interesting aspect of this area however is the trackage itself, which is almost optimal for a small layout. A very long siding with several customers and a long sorting track (the “main” line) helps ensure smooth switching moves while inducing a challenge in sorting of cars and re-spotting ones that don’t move. 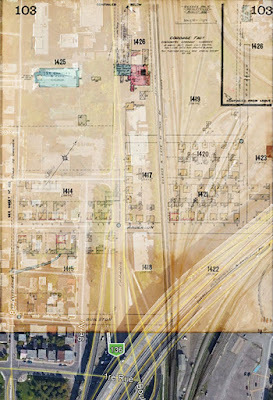 Looking at aerial photographs from 1948, it becomes evident the long siding depicted on the fire insurance maps was at that time broken in several shorter sidings. The most interesting one was serving the produce warehouse and two oil dealers… Not bad for a small industrial layout! Another interesting thing is this industrial spur didn’t have a clear cut siding/main line dichotomy modellers love so much. In fact, according to the same aerial pictures from 1948, cars could be spotted anywhere it was convenient for customers. In the case of the lumber yard, both tracks were used, even if by our modeller’s standards we would consider it was a hindrance. Given how tracks were used, we can define what I would call “official” and “unofficial” car spots. Official ones are where you can find a loading dock, an unloading rig or a warehouse dock. You can’t fiddle that much with these elements and better keep them as they were to better capture the prototype. In our case, it appears the produce warehouse had two dedicated spots. One of them was for cold storage, thus probably only served by reefers, while the other spot was general purpose and could probably handle both boxcars and reefers. Next to it is Cities Services spot. It could have handled two tank cars due to its length, but I have no definite proof. An unloading pipe probably dictated where the car(s) had to be spotted. The same can be said of Champlain Products which was similar. The next one was Supertest Petroleum which was served by a dedicated siding. 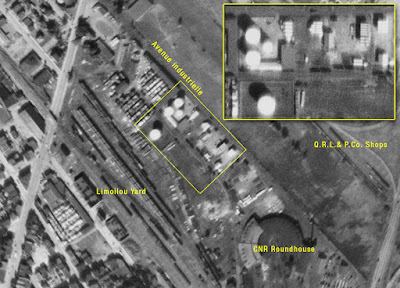 Interestingly enough, just like British-American, they had a rail-served oil warehouse. Given the layout has already enough industries, this one could be modelled as a static display with a track a few cars that could be swapped by hand to add visual interest. 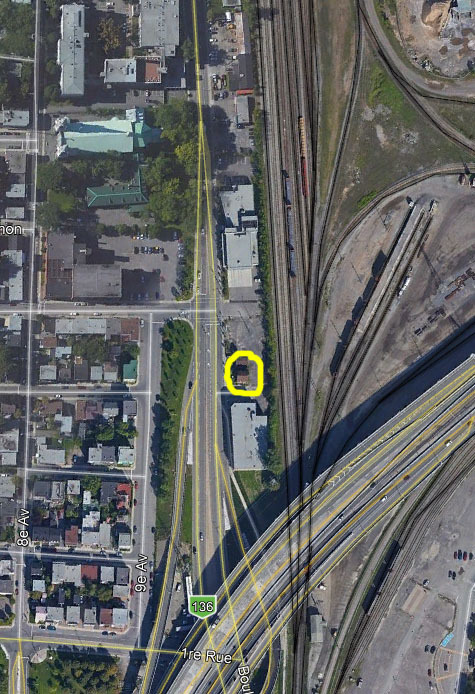 Impromptu (or unofficial) car spots would be near the lumber pile where cars could be seen back in the days. It could be a flat car, a gondola or a boxcar. Finally, the long stretch of track could harbor many types of car and be used as a team track or an off spot storage on an irregular basis. It may sounds absolutely low key and simple, but simply adding a car on the “team track” could be quite a challenge in itself. I certainly wouldn’t abuse of this trick too much when spotting cars! Interestingly enough, both modules can be assembled together (as in real life) and with a longer cassette or switching lead, make for a growing layout that can be built in steps. Some final thoughts… The more I think about it the more I consider such a prototype would make for a great “club” layout. Imagine you model the entire spur full scale, make room for a long switching lead and a sorting track replicating work done in the larger yard. Not only you get yourself a very interesting layout from a visual and thematic point of view, but one that is highly manageable. With only 2 turnouts, track issues won’t be a problem. With more space, the shelf can be built at about 18 inches-22 inches large to better represent each customer and their structures, giving depth to the scene without over reaching. 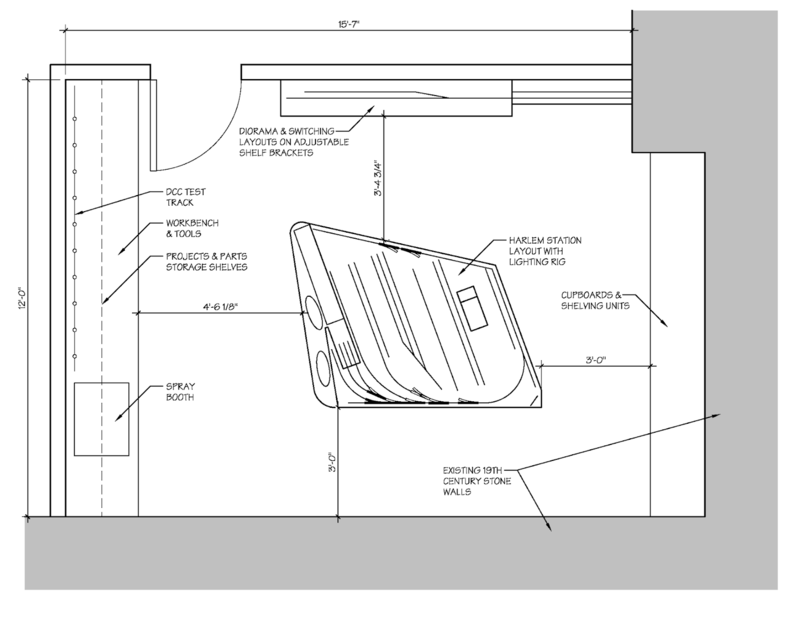 There would be about 20 car spots, which is quite a lot, even for “larger” layouts, in less than 18 feet in length. As for motive power, a good steam switcher such as a 0-6-0, a 0-8-0 or anything else used in yards would be at its place. To take advantage of serious advances in diesel locomotive control (ProtoThrottle), any early EMD or ALCO switchers would do the job. Even smaller GE 44-ton wouldn’t be out of place at all and could particularly be of interest for people modelling large scales. Avenue Industrielle in S scale (about 9’) or O scale (12’) would be terrific and absolutely within reach for most people and lend itself to high quality rolling stock, scenery and structures.